Aaaaaaand we’re back in London. Technically this time I’m back from early Friday afternoon and flying out late Saturday night the following day, so it is slightly more than 24 hours. But I’m spending Friday night doing zero tourist like things as I’m catching up with some friends in London, basically heading out to the pub and over to the casino after for some fun. Gambling in Hong Kong is not legal and most people head over to Macau to gamble. Personally, I don’t find gambling that interesting, so it was more to spend some fun time in London. The funny thing is, I didn’t even bring any form of ID to enter the Casino, but the bouncer just asked for my birthday and let me in. I stayed at the Roulette table for the most part, had 2 mojitos and called it a night. But at last it was good to meet some colleagues/friends from our London office whom I’ve worked with for 3 years but have never met. Before I met up with them at the pub, I also stopped at the bridge just over Embankment station during sunset. Facing South, the London eye is just in front on the left, and the Westminster Abbey just on the right side. Thanks to a tourist couple, they snapped a great picture of me on the bridge. The line was super long when I got to Baker Street Station, but I didn’t have any intention of going inside the actual museum. I think everyone is secretly wishing that for some reason Benedict Cumberbatch would appear and walk out of the door. There was a nice shop on the side, where you can buy some Sherlock Merch. Continuing the Circle Line, I went from Baker Street station to Ladbroke Grove Station over to Portobello Market. The day was perfect, just sunny enough and not too warm. There were a lot of stalls along the street selling handmade jewelry, trinkets, books, paintings etc. There are also some souvenir shops that sell cheaper souvenirs than the ones in the central London, and I found the perfect souvenir – a little piggy bank in the shape of a London Royal mailbox. I wandered around the neighborhood but didn’t buy much. It was just so nice to see all the people and the buildings, enjoy London’s lovely summer weather. I also stopped by Buckingham Palace while heading to my hotel. I know it's highly touristy, it's crowded and all that. But seeing the guards through the gates were somehow exciting. They were so far that them marching around just looked like little nutcracker dolls in the distance. I went to this museum first thing in the morning on Saturday, but there was a line already outside! I was worried it’ll take a while, but it seems to be a quick security check that is holding up the line. I got in shortly after and ran in like a school kid. The museum was really crowded so it was difficult to navigate around. The central hall was sadly closed as they were installing the big skeleton of the blue whale. I wandered around through the different exhibits quickly. Even though I love science, a lot of the information were things I either already knew, or would be more keen in learning about by watching a documentary or nature piece by BBC/Discovery Channel. Although, I will say that the long escalators up to what looks like Earth still in Lava form from when it was first formed was really cool. Inside you could also see constellations on the ceiling of the dome. Collection: 145 galleries, 5,000 years of art covering Europe, North America, Asia, and North Africa. This is hands down my favorite museum out of the 3 I’ve visited in London so far. I never thought I’d be really into art, but the V&A has such a broad collection and also from all around the world, it is very fascinating to me. Being a travel enthusiast, I can see each country and each era’s story coming out from the different pieces. I especially loved the sculpture room, the stained-glass hall, and the art library inside the museum. This is a place I would definitely go back again. Overwhelming is the word for the British Museum. There’s walls and walls, cabinets after cabinets of art work. You are staring at pieces of human heritage behind glass, just rows and rows, all around the world and journeying through time. I wish I had more time to soak everything in slowly, but the Museum was also overly crowded and very warm. I ducked into some of the air-conditioned rooms and took my time there, two of which were the Japan and Korea exhibitions. It’s odd I just flew across the world to see Europe, yet I’m now staring at artifacts from Asia. As I write this blog, it is already 2 months post this trip. I’ve experienced so much and there is just too much to write about. I wished I could preserve my feelings at the time of travel, as they are more vivid when fresh. I remember touching down in London, the feeling of seeing the London Underground sign, wandering through Cambridge, having Nandos non-stop. And then getting into Marrakech, my first scare of someone taking away my passport, getting used to the 40C desert heat, falling in love with the tea and landscape of the desert, and standing in Ait Benhaddou where Khaleesi stood with the unsullied. I look back fondly on my brief accidental encounter with Milan, Italy, as my direct flight to Munich was cancelled and I was rerouted there. At last, I was in Germany, after learning the language for 1.5 years and longing to visit, I tried all the pork dishes and beers, I finally visited the fairytale castle of Neuschwanstein and the small medieval town of Rothenburg, and the many many breathtakingly beautiful churches of Munich. The Danish Castles and Palaces in Copenhagen and the Swedish town of Malmo were absolutely stunning. And lastly, I conclude my trip in London, blown away by the extensive collection of its Museums, free of charge for all visitors. Each time I travel, I appreciate the beauty of our planet and the heritage of mankind. We are all the same, yet unique in our own ways. It seems as if my travel itinerary is an impossible mission, with 7 cities, 5 countries, and 1 desert in 2 weeks. But this is how I live my life, to the fullest. My Instagram shots weren’t planned in advance, my photos were just framed as I saw the world happening through my eyes in front of me. The photos, are just there for me to tell stories and to share my experience with you. Selfishly, there are a lot of behind the scenes moments where I have my phone and camera down, and I am just enjoying my time talking to the locals of the place I’m visiting, or soaking in the scenery in front of me. There is so much in an experience that you cannot put into words on a blog, pictures on Instagram, or videos on Youtube. Hence why, I hope that through the posts I’ve made about my travel, I can inspire you to go on an adventure. Thank you for following me through this grand summer trip through Morocco and Europe. As always, Live, Love, Travel, and Enjoy Life. 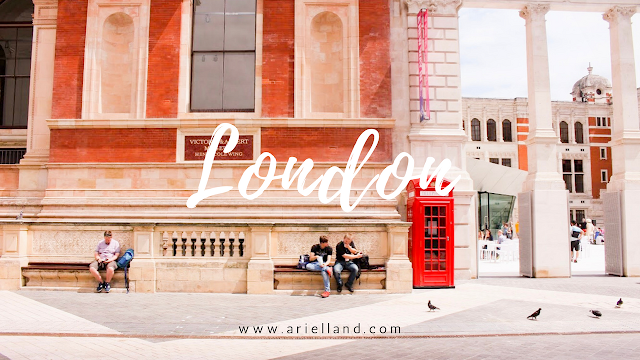 London is one my dream cities that I have planned to visit at least once in my life, and after seeing your experience, I'm even more excited. I love your post, awesome job! Thank you so much! I hope you'll get to see London one day, or if you already have I hope the weather was on your side and you had fun!